At present, BLDC motors are mainly used in the wheel drive, air conditioner compressor, air conditioner blower, purifier and exhauster of the automatic industry. DC brushless motor is often used in automotive purifier to drive centrifugal blade to discharge polluted air. The motor body is determined according to the motor circuit scheme, and a two-phase bridge commutation drive circuit is generally adopted. The inner stator winding can be easily wound on the core teeth. The motor is made into an external rotor structure, both stator and stator winding are placed inside the rotor. ASIC is generally used in the commutation drive circuit, which is simple with the control and protection functions. Development of low-voltage and large current BLDC motor for automotive air conditioner can solve the shortcomings of the original BLDC motor, such as high noise, short service life and difficult maintenance, thus improving the motor performance. Punching sheet of the motor stator adopts a 12-slot structure, as the BLDC motor operates at low-voltage and large current, a double-wire parallel winding is used to reduce the conductor diameter and ensure that the current density is not too high. The rotor adopts a permanent magnet bonded four-pole structure on its surface, and the permanent magnet body is made of rare earth permanent magnetic material Nd-Fe-B. Due to the high remanence and coercivity of Nd-Fe-B, the direction of magnetization is short, so the permanent magnet body adopts a radial tile type. Hall element is selected as the position sensor and installed on the inner surface of motor end cover, the magnetic field of position sensor is axial magnetic field. 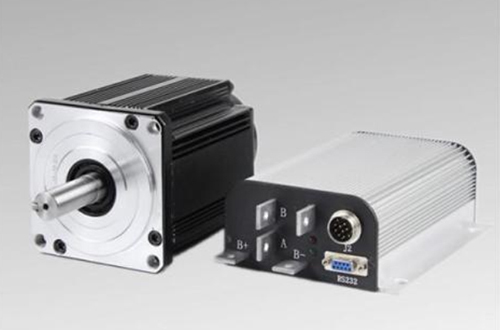 At present, motors for vehicle driver can be roughly divided into four categories: DC motor, AC motor, brushless DC motor and reluctance motor. It's proved by practices that brushless DC motor has obvious advantages. Four wheels of an electric vehicle are driven directly by four independent wheeled motors. With an inverter for electronic commutation and removal of mechanical commutator and brush, this structure is suitable for high-speed operation and doesn't affect the motor body when replacing tires. Application of external rotor BLDC motor with direct driven and no gears is a more advanced scheme of motor for vehicle driving in the world today. Moreover, the disc permanent magnet BLDC motor has large torques under low speed, it can drive the front or rear wheels directly in electric vehicles, thus omitting the mechanical transmission. The disc permanent magnet BLDC motor has characteristics of compact axial structure, convenient installation, low noise, reliable operation and stepless speed regulation. Its air-gap magnetic field is axial, the stator winding is composed of radial arranged conductors, its rotor is installed in disc yoke in alternating form of N and S by sector permanent magnet.